For the ArchiMate 3.0 experts: What is the preferred way to model a Server Farm given some of the new elements in ArchiMate 3.0? 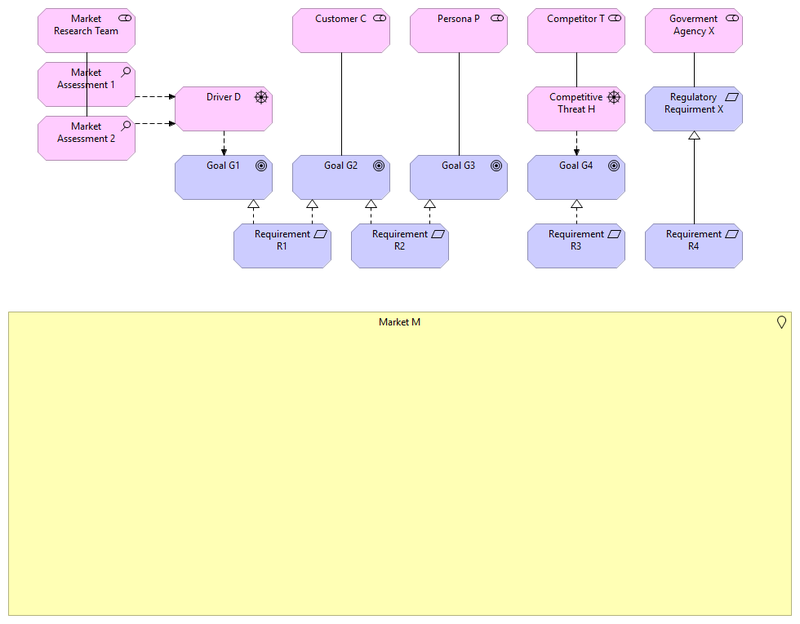 In ArchiMate 2.1, a collection of nested Nodes was the most obvious solution. 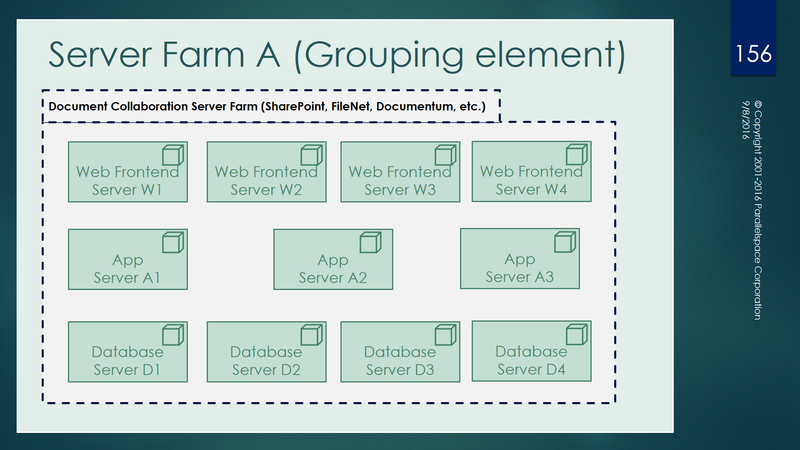 What is the preferred approach using ArchiMate 3.0 to model Server Farms given a) Grouping is now a (an almost) first-class concept, and b) the new Technology Collaboration element. What is the best choice? Here’s 2 examples: Server Farm A using Grouping and Server Farm B using a Technology Collaboration element. I’ve used slightly different scenarios for each example but my assumption (hope) is that is shouldn’t make any difference. What is the preferred way to model a Server Farm given the new elements in ArchiMate 3.0? a) Grouping, or b) the new Technology Collaboration element. …or something else? What are the pros and cons of your choice? Add your answer to the Comments section. p.s. 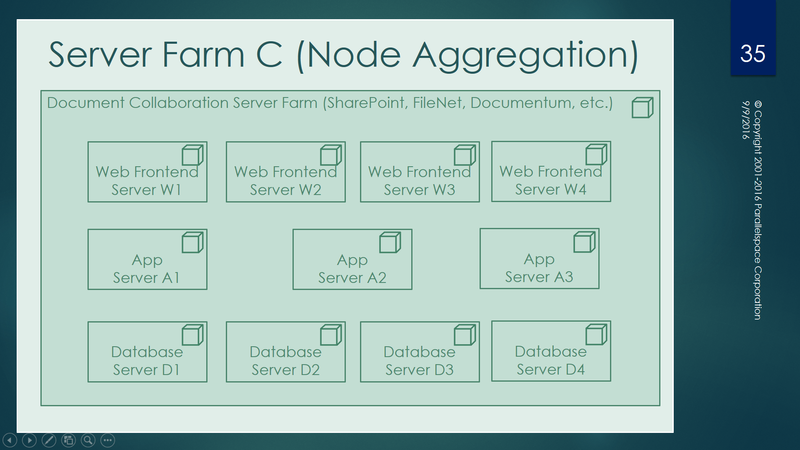 Below is a model for Server Farm C – using the Node aggregation approach we used with ArchiMate 2.1. Michael Herman (Toronto) I recommend using a Location to represent a Market and to aggregate the concepts that are relevant to each market and to your model’s goals. This includes using Location as an abstraction for specific B2B and B2C markets – making sure to document this practice in your EA governance document. The aggregated concepts can [be] nested within each Location as a mini-model. Each mini-model can include Stakeholders (including specific or representative, customers, government entities, other regulatory bodies, competitors, etc), as well as Constraints and Requirements imposed by the preceding Stakeholders, etc. The market-specific set of Constraints and Requirements can then be linked to a possibly smaller, more uniform set of Drivers. Ownership and updating of the Market mini-models, singly or in total, can be given to a member of your EA team or a business client within your organization. Elaborate Market models can be licensed or sold – but I’m getting off topic. As a follow-up, here’s a concrete example using ArchiMate 2.1 and the Archi modeling tool; including the exact steps I followed to create a Market mini-model. Start at the top: Most Markets are defined by their Stakeholders: Customers (or their Personas), Competitors, and Government Agencies (and perhaps, other regulatory or standards bodies). Use these to drive out a selected set of Drivers and Goals for your next product release. Of course, the current state of your Market model doesn’t have to respond to every Stakeholder or Driver. Include all of these in the model but, in the current state of the model, only include the Goals you are trying to satisfy in the next release. From the Goals, derive more specific product or service Requirements. In addition, add a Market Research Team as a Stakeholder to document specific market analyses or Assessments as part of your mini-model; linking these to a new or existing set of Goals. You’ll end up with something like the following. Click to enlarge. Of course, the current state of your Market mini-model doesn’t have to respond to every Stakeholder or Driver. Include all of these in the model but, in the current state of the model, only include the Goals you are trying to satisfy in the next release. From the Goals, derive more specific product or service Requirements. TIP: Because of the way ArchiMate works, make sure each Driver, Goal, Assessment, Requirement, etc. is linking to a Stakeholder; hence, the reason for creating the Market Research Team stakeholder. TIP: Consider creating 3 views (I call them Construction Views) to help you track your work. In my model, I called them Markets 0, Markets 1, and Markets 2. The above view is Markets 0. Then select all of the elements of your Market mini-model, and drag and drop them onto a Location element (named Market M in the above example) to get the second version (view) of the model. TIP: Different ArchImate modeling tools handle this action in different ways. In my example, Archi prompts you to add Assignment relations to relate each of the 5 Stakeholders to the Market M location element. I’ll talk more about this later. …and voila!, here is one example of a Market mini-model. Use the same technique to create mini-models for your additional markets. Click to enlarge. What’s going on behind the scene views? To understand how ArchiMate (and Archi) chose to model this scenario, after you’ve dragged and dropped your mini-model onto the Location element and accepted the creation of the new Assignment relations, do the reverse: select all of the mini-model elements nested inside the Location and drag and drop them outside of the Market M location element. Your (third) view should look something like the following. Click to enlarge. 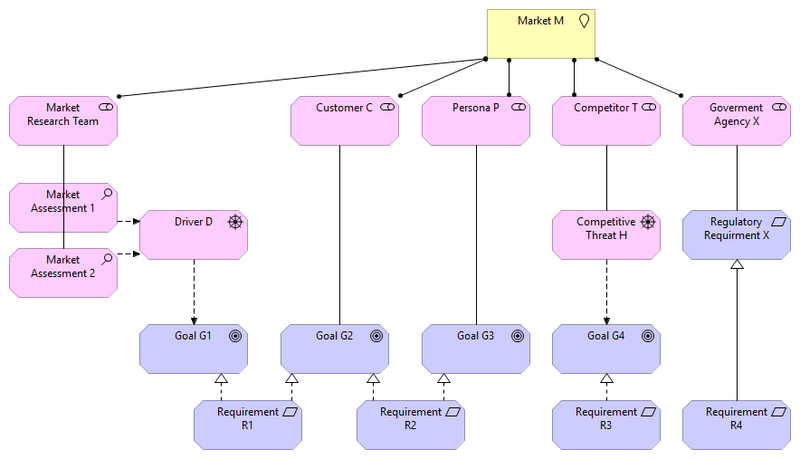 The Market M Location element is related to each Stakeholder using the automatically created Assignment relations. The rest of the mini-model is related to the Location element via Derivation. This is why it was important to have the Assessment, Driver, Goal, Requirements, etc. elements related to a Stakeholder. Every language (conventional or technical) has its idiosyncracies. Use ArchiMate and make it work in a way what works best for you and your organization. p.s. Please add your feedback in the Comments section below. How can this idea be improved?